June | 2011 | SayWhat? Too Funny. From the Onion, via Joe Romm’s excellent ClimateProgress blog. Bad Science Influences the Supreme Court? Today is a word day here. Pictures and video will return soon, I promise. I have been baffled by Freeman Dyson’s skepticism about climate change for some time now. The guy is a brilliant physicist, and his weighing in against the overwhelming consensus of a field outside his own several areas of expertise has unfortunately led credence to some very bad science. A New York Times Magazine article about Dyson’s climate skepticism has now snuck its way into a major United States Supreme Court decision as support for the view that “the science is not settled” about the effects of CO2 emissions. The next several posts will contain pieces of a story about the courts that will come back around to the recent legislative attacks on the EPA. The case decided by the United States Supreme Court last week, American Electric Power v. Connecticut, has been closely watched because it is only the second time our highest court has decided a case of this general kind on emissions and global warming policy, the first since Massachusetts vs EPA. Last week’s decision could change the landscape for the initiatives against the EPA underway in the House of Representatives, and related court cases that have been filed in several states and in the federal courts. The battle of regulating greenhouse gas emissions is a much more interesting and revealing story than it might appear to be at first glance. And some of those court cases now pending have been led by teenagers, which will take us back to the question of “who has the youth.” So bear with us as we start in the middle and look at this a piece at a time. The stage is set nicely in “Supreme Court Decision on Emission is Good, Bad, and Ugly for U.S. Climate Policy,” by Yale Law School Professor Douglas Kysar. Published in both Nature and Scientific American, it points to, among other things, the influence on the court of unjustified skeptical attacks on climate science. Click here for Kysar’s brief and lucid analysis. The “Ugly” part is somewhat frightening. I have not yet seen the energy education curriculum that the U.S. Chamber of Commerce has contracted Scholastic to publish, but in the wake of the article in the New York Times about internal natural gas industry worries about hydro-fracking, I am struck by another emerging development about fracking: A campaign to equate all the legitimate benefits of natural gas with the unconventional and controversial methods of hydraulic fracturing to extract it, but mostly, to target elementary school students with this campaign. An article in last week’s Pittsburgh Post-Gazette notes Chesapeake Energy’s efforts on this front (Chesapeake Charlie! ), as well as the coloring book being widely distributed by the Canadian company Talisman Energy’s “Good Neighbor Program” at community picnics in Pennsylvania. 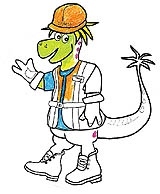 “Talisman Terry’s Energy Adventure,” a “friendly Fracosaurus” explains the safety and virtues of hydro-fracking. I have reviewed books in the past, but never a coloring book. So, in the spirit of moving to this genre, here is my 84 second review of the coloring book, along with images of the entire book itself. My thanks to Sean Bender (Harvard, class of 2014) for his excellent assistance with crayons, scissors, paste, and a few other things. The following video features highlights from an actual event sponsored by Encana Natural Gas. As deep water drilling resumes in the Gulf, here is a quick introduction to Rep. Ralph Hall (House Science Committee Chairman) and Rep. Joe Barton (very influential member of member of the Energy and Commerce Committee). Right. And some dead people and an ecological and economic catastrophe, too, amidst that bubbling and blossoming. Smokey Joe Barton, as many of you will recall, was the congressman who apologized to BP executives for the way the government was treating BP after the explosion. Specifically for the outrageous (?) idea that initial relief funds be set aside by BP. As drilling of this type resumes, any change in liability laws for such accidents, or any real understanding yet of the magnitude of the economic and environmental impact of Deep Water Horizon? In October of 2002, the Wall Street Journal described Barton as the “House GOP’s leading expert on energy policy.” All the more remarkable if you have a look at our earlier post about his exchange with Energy Secretary Chu. If you have not watched this exchange, it is one of the things that made me think it might be worth blogging about where our political leaders stand on energy and climate policy. Presidential candidate Michelle Bachmann, a clip of whom was featured yesterday, is now following House Science Committee member Dana Rohrabacher’s lead in adopting a very strange philosophical position: First, acknowledge that we have an obligation to future generations. Solid reasoning and good news so far. But, then, get this: It turns out the obligation we have to our children is to repeal clean air and clean water legislation. Reading Joe Romm’s excellent post last week reminded me of the same twisted reasoning in a speech to congress by Rohrabacher. Recall that he is one of the senior members of the House Committee on Science, Space, and Technology, and Chairman of the Foreign Affairs oversight committee. Note the bobbing heads of other presidential candidates at the GOP “debate” as Rep. Michelle Bachmann joins the chorus of congressmen hoping to de-fund and de-fang (heck, to eliminate) the Environmental Protection Agency. Much more on the assault on the EPA in further posts. Newt Gingrich (Gingrich on EPA) and Rep. Barletta (Barletta on EPA) are merely echoing what has been going on in congressional committees all year. Interesting how tone deaf this major congressional initiative is with the voices of most Americans (Americans on EPA).